PM Narendra Modi’s everyday attire costs lacs to Government, paid from Tax payers money. A message in circulation since few years claims that Indian PM Narendra Modi’s everyday attire costs lacs to Government and is paid from Tax payers money. 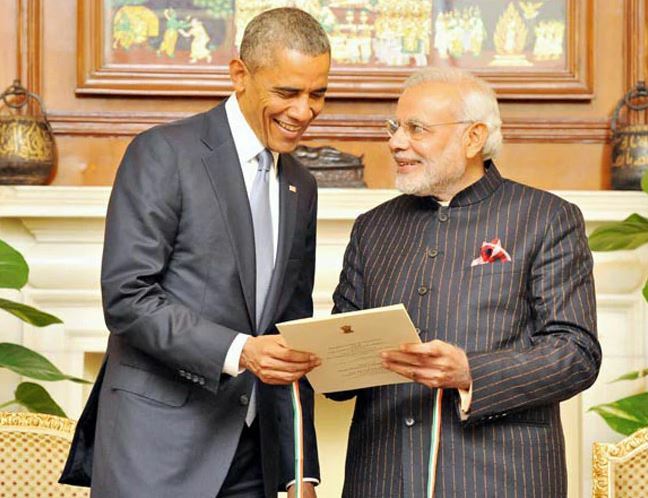 The allegations surfaced when PM Narendra Modi wore a monogrammed navy-blue suit during his Summit talks with US President Barack Obama back in January 2015. So, let us examine if there’s any truth to these allegations around Modi’s costly wardrobe. On Indian Republic Day 26th January 2015, PM Narendra Modi wore the navy-blue suit while on ‘Chai pe Charcha’ programme with US President Barack Obama. The monogrammed suit had Modi’s full name embroidered and generated substantial controversy in media. Some people suggested the suit costed about Rs 10 lakh, if not more and questioned if the money came from Taxpayers money. Later, Delhi Chief Minister Arvind Kejriwal of Aam Aadmi Party said Modi’s daily wear costs the Government 10 lakh rupees per day. Stories about the costly wardrobe of Modi soon went viral on social media. Some even went on to say PM Narendra Modi is corrupt. Narendra Modi’s Everyday Attire Costs Lacs? The claim seems to have originated from an article on 26th Jan. 2015 published in London’s Evening standard website standard.co.uk. The article published with the title, “Londoner’s Diary: Only Savile Row will suit to meet the President” actually mentioned below assumption – without validation. It appears that the suit has come from our very own Savile Row, with fabric made by “cloth merchants of distinction” Holland & Sherry. The fabric alone — seven metres required to make a suit — would have cost somewhere between £2,500 and £3,000. Holland & Sherry supplies the fabric to international tailors Tom James. The Londoner imagines the final bill for such a suit would be approaching £10,000. After the controversy around costly suit surfaced, an NRI from Gujarat revealed he gifted the suit to PM Narendra Modi. Rameshkumar Bhikabhai Virani is the man who gave the suit to Prime Minister Modi during Gujarat Summit, also inviting Modi to attend his son’s wedding on January 26th. Rameshkumar rubbished the claims that the suit could have cost Rs 10 lakhs saying, “My son does not have the guts to spend that kind of money or that amount.” According to a report in DNA website dnaindia.com, the monogrammed suit was stitched by Modi’s regular designer Jade Blue. The Ahmedabad-based chain of garment stores designed the famous ‘Modi kurtas’ also. The designer monogrammed suit Modi wore went on auction later and the money moved into Swachh Bharat mission. After the suit became popular, it was sold for a staggering Rs 4.31 crore, which went into Namami Gange Trust Fund, a programme for the cleaning of the River Ganga. It happened to be a Guinness record of Most expensive suit (clothing) sold at auction. Even earlier, as Chief Minister of Gujarat, Modi auctioned his gifts and raised crores of money for charity. Following the row about PM Modi attire, RTI activist Rohit Sabharwal sought Right To Information about the government’s expenditure on attires of Prime Ministers. RTI revealed Prime Minister’s personal attire expenses are not paid by government. Therefore, the claim that PM Narendra Modi’s everyday attire costs lacs to Government is a hoax. For your information, not just about the attire, in past many bizarre RTIs were raised on PM Narendra Modi. One applicant sought PM Modi’s kitchen expenses in his coveted residence at 7, Race Course Road in New Delhi. The PMO replied Modi pays the bills for his kitchen because he believes it is personal in nature. It suggested Modi’s kitchen bills are not incurred on government account. Another RTI in 2016 questioned about costs of picnics for PMO staff, whether PM’s Principal Secretary, Nripendra Misra arranged any. PMO clarified that PM’s office or the Principal Secretary had never organized any picnic or excursion for the staff.